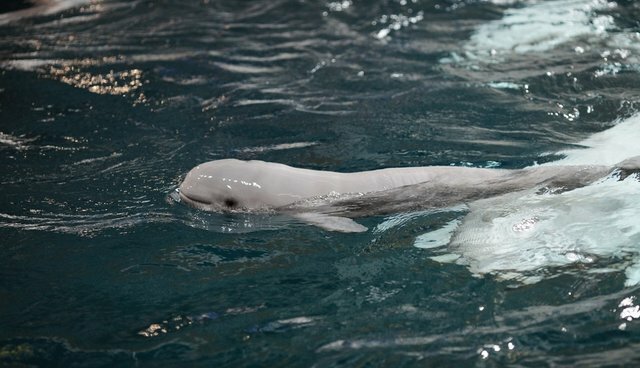 Less than a month after being born in an artificial tank at the Georgia Aquarium, a baby beluga whale has apparently lost the will to stay alive - threatening to cut short what would likely be an entire lifetime spent in captivity. 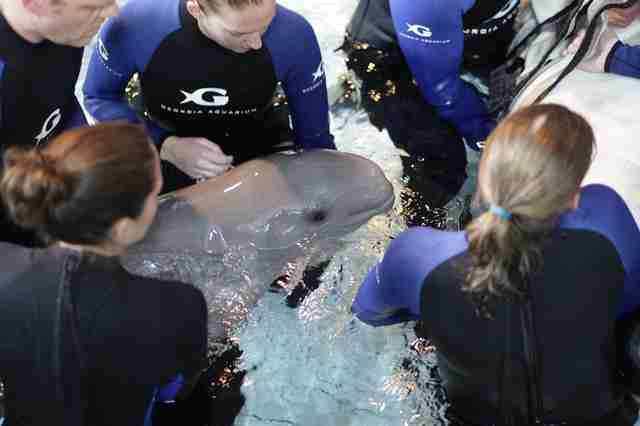 "Currently, the calf has stopped nursing and is still not gaining weight, even with our assistance," the calf's keepers wrote in a statement. "We consider her current status as extremely guarded. We have been working around the clock since the animal's birth to monitor and support both mother and calf, including consulting and working with the very best experts in the field of veterinary medicine." It is unclear if any outside factors may be affecting this beluga calf, but her failing health still comes as no surprise. The mortality rate among baby belugas in captivity is a troublingly high 65 percent. Additionally, belugas who do survive to adulthood in captivity live shorter lives, routinely dying before reaching 30, unlike their wild counterparts who can live to age 60. Given that the sources of mortality in the two environments [wild and captive] must differ, it is highly plausible that the primary cause of mortality in captive belugas is related to stress, which would be long-term or chronic in a captive situation. Given the known deleterious effect of chronic stress on immune function, it is plausible to argue that captive belugas lead less healthy lives than their wild counterparts, both psychologically and physically, which would explain why, despite protection from natural hazards, they do not live longer in captivity. As of March 2015, the aquarium continues to seek permission to import wild-caught orcas as the success of its own breeding program is plagued with uncertainty. Only time will tell if this most recent beluga newborn's condition will improve, but as long as she is kept captive, a tragic fate still awaits her. UPDATE 6/5: The beluga calf has died, the Georgia Aquarium reported on Friday morning. Her exact cause of death, the facility says, may never be known.